The FIRST CONGREGATIONAL SOCIETY of St. Joseph was organized in 1867 with 10 members. In 1870, a small frame church was built in the 900 block of Edmond, which served until the building at 13th & Jule was completed in 1891, known as the Tabernacle Congregational Church. Designed by the local firm of Eckel and Mann, this church features a Chateau Romanesque design, which the firm used in several large mansions it designed during this period while Harvey Ellis was in the employ of this firm. The Sunday School Assembly Hall was separated from the worship space by a series of push-up wood panel doors. 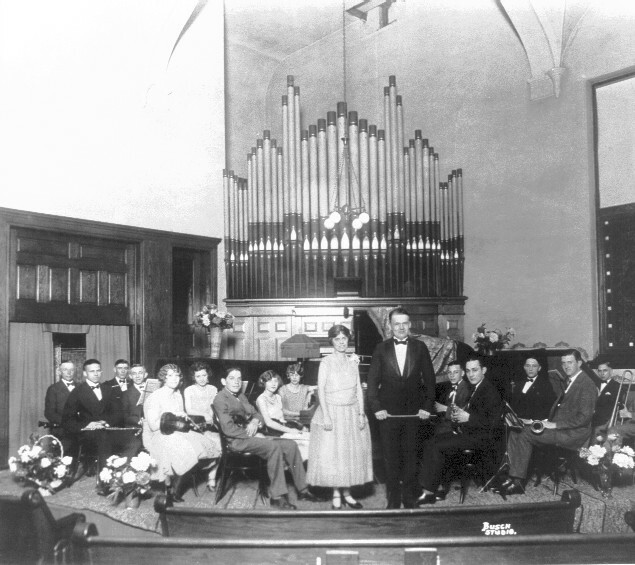 In 1904, the congregation purchased a small two manual pipe organ from the Hook & Hastings Co. of Boston, listed as Opus 2025, containing 21 “registers”, which would have included couplers. This organ was replaced or substantially rebuilt in the late 1940’s. Only the impost survives. In 1961, the congregation merged with Trinity and First Evangelical & Reformed churches to form Faith United Church, the denominations having previously merged to form the United Church of Christ. The congregation built a new building at Ashland Avenue and Karnes Road in 1966. The Jules Street property was purchased by the First Baptist Church in the 1970’s and later sold to Calvary Chapel, which now occupies the property.